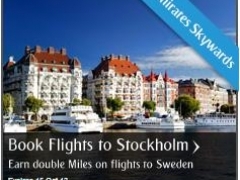 Celebrate the launch of our new route to Stockholm and earn double Miles when you fly to Sweden's capital from any Emirates destination. Fly daily from 4th September 2013 and experience an innovative city with a thriving museum, art and culinary scene. Built on 14 islands, Stockholm’s waterways can provide as much entertainment as its charming streets and trendy cafés. For registration and ticket purchases between 2nd June and 15th October 2013. For travel between 4th September and 31st December 2013.